The congregation desired to build a sacred space to host the holy in a context of secularism, consumerism and dehumanization. It desired to build a visual prayer, putting into stone, concrete, steel, glass, stucco and wood its theology and mission. 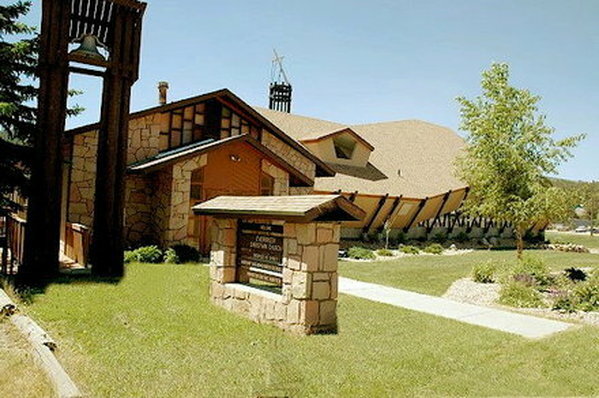 The building itself was conceived as a sacramental sign to help people come into the holy presence of God. It was built as a gift to the people of Evergreen and a doxology to God. The new building was designed to be a teaching tool, much as were the old cathedrals. The cathedral architecture and iconography which depicted biblical stories, Christian themes, and the spiritual longings of the people in mosaics, frescos, paintings and statuary, were used as an environment of learning, story telling, and theological insight. The architecture and iconography of this new church depicts the theology and mission of the congregation, offering an alternative story of keeping the secular world open for God. The design essentially says, The holiness of God remains wrapped in a divine mystery beyond the human desire to domesticate God, and yet is revealed to us as a God who lives among us in loving embrace, inviting us to affirm and welcome all people in the sacredness and warmth of an intimate community of faith. The basic design of the new sanctuary is one of breaking open and lifting up freedom from the principalities and powers that would bury, captivate or seduce us. Using the St. Andrews cross (the symbol of the Disciples of Christ), the roof line is broken open to reveal clerestory windows at the height of the sanctuary, letting in the light of God. The structural integrity of the church, theologically speaking, is the cross this is reflected architecturally in the use of the St. Andrews cross in the trusses which form the structural integrity of this building; the cement foundation is a reminder of our building on the 2000 year history of Christian faith; the black metal work represents both historic and contemporary disciples who simultaneously support the church and are sheltered by the church. The colors through the facility are earth tones, reminding us of the earthiness of the Jewish/Christian faith and our own call to the care of creation. The narthex is the entry way into the church, a place of welcome and greeting. In the middle of the narthex is the deck-covered baptistery, placed here because baptism is the sacrament of entry into the church. Drawing on our rural heritage when church members accompanied those to be baptized to the river, we will leave the sanctuary to supportively gather around those to be baptized, thus being active participants in the liturgy of baptism rather than passive observers. Note the baptismal hymn placed above the fountain and near the carving of the apostle Andrew fisherman, evangelist, missionary, apostle. Note also the Candle of Hope on the wall opposite the entry, burning as a reminder of all who suffer oppression and that our baptismal identity is in solidarity with the Christ who suffers with and in them. Above the baptistery is the window for light from above, framed by the different shapes of iron work. These cylinders represent the diversity among us as individual Christians who are yet made one in the one baptism into Christ. The disciples are both under the cross and support the cross as it is lifted high into the world in which the church is planted. The inclined cross above the church reminds us that the cross is a sign of humility rather than triumphalism, a symbol of suffering rather than a conquering flagpole. It also reminds us that Jesus was bent under its burden as he carried it to Golgotha. organ lofts for liturgies of music (the choir loft is at the rear of the sanctuary enabling the choir to help lead the congregation in worship without a sense of performance. The communion table has been built out of pieces of wood brought from the homes and histories of the members of the church signifying that Christs' table is our family table. Behind the communion table is the rererdos on which is manifested the St. Andrews cross while the traditional cross is at the apex of the chancel. This is a reminder that we take up our crosses under the cross of Christ. The upper part of our older building has been remodeled into our commons area for fellowship, hospitality, puppet ministry and general meetings. We celebrate here our common life together, moving from the communion table to the common table. Table fellowship in which the stranger is welcomed (hospitality, in the Greek testament, literally means love of the stranger), is central to Christian community. The lower level is now our Care Center: Counseling, Administration and Religious Education. Here the Christian story, which has been celebrated in worship, is now learned in education, shared in counseling, and administered in service. This sacred space, built in the heart of Evergreen, is here for you. We invite you to join us in the journey of faith. May this place indeed be a house of God for the people of God, into which light flows and from which light is taken into Gods' world. A few words are appropriate concerning the art of abstract expressionism in a sanctuary designed to host the holy. The way we see is affected by what we believe; likewise, what we believe affects how and what we see. Our seeing always comes before words and remains after words. Seeing in the spiritual life is through the eye of faith. This window invites the worshiping community to expand its horizons of seeing beyond objective representations in a universe of discourse where "the eye cannot see and the mouth cannot tell" all holy mysteries. Art helps us to situate ourselves in our world and induces more than rational meaning. It infuses passion and thought, thus inducing feelings and insights (not simply information), combining memory and hope, touching experience, reshaping our world, creating longing, raising questions and firing our imaginations. What is absent is held in presence; what has been hints of what is yet to come; what is seen gives way before that which beckons us toward renewed and redeemed seeing. This is a fitting medium for a memorial window for we not only look at the window and remember, we look through the window beyond the constraints of our mortal eyes. We hope. Sister Wendy Beckett, a contemplative nun and art historian in the Carmelite monastery in Norfolk, England says that art is a means of freedom. It helps us to move out of our personal anxieties and disappointments into the vast world. We must look, as opposed to just seeing. It takes time and concentration but is most richly rewarded. Truly to look remains ones personal responsibility, and nobody elses' response can be a substitute. With that warning and insight in mind, it is still perhaps appropriate to risk a few pastoral reflections on this piece of art adorning our sanctuary. The commotion of this picture engages us in the confusion and movement of our world and sets us in the vast world of the universe and beyond. Its rainbow colors and varied shapes bespeak the great diversity of the creating and creator God, a diversity of which we are all a part. Yet there is a centering focus in light which connects and touches all realities and beckons us beyond known realities, inviting us into infinite eternity. The lower right quadrant calls our minds to human creativity, the building of the human city, the human offering of our work as those called to be co-creators with God. Incarnation is hinted at, as the light at the center of the universe infuses the "cornerstone" and the Greek chi rho (the symbol of Christ), who is the true human being and companion at our table in our journey. The lower left quadrant bespeaks of plain and mountain, of nature and environment, the very artwork of God. The two upper quadrants depict the mysteries of the universe, calling to mind that we not only live in time and space, but beyond time and space in the eternal love of God. Time and eternity, inner and outer space, nature and grace, freedom and interdependence emanate from the window. The Trinitarian nature of God, Gods' own interrelatedness, and the interrelatedness of God with all the world (which is the first object of Gods' love - John 3:16) are powerfully imaged in the light of the sun. The sun penetrates and fills the Christic symbol of the chi rho cornerstone, affirming Christian particularity in Gods' universal love. The blue free flowing streamer, representing the Holy Spirit, touches and connects all reality. These reflections are simply a beginning point for your own seeing. May Gods' light come in and go out from this sacred space. This window is based upon the following theological and philosophical insights. It reflects the mystery of our faith, which is ultimately beyond words, thus inviting symbolic artistic expression to fire our imaginations. 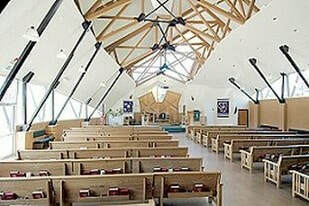 Its art of abstract expressionism compliments the contemporary architecture of our sanctuary. Its postmodernist perspective fits the complex nature of the culture in which our mission takes place. It invites our continued reflection for making meaning together as a Christian community who live in nature and grace, faith and mystery, time, and eternity.